Improved the line attaching algorithm. Added ability to create broken lines (through adding nodes) and create hyperlinks to documents and web sites. 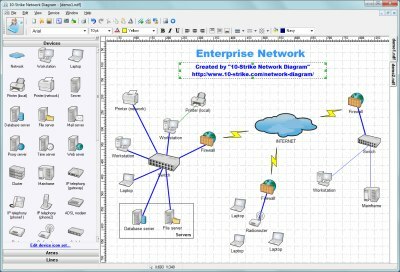 network, diagram, map, local, lan, program, software, computer, switch, snmp, topology, visio, topography, structure, mapper, diagrammer Create a diagram of your local area network quickly with this powerful network diagrammer and mapper, export it to popular file formats or MS Visio. The program will scan your switches via SNMP and discover the LAN topology automatically.